It has been an extremely long time since I’ve seen such a spirited creation come from E3. Something that immediately had me on the edge of my seat and at the front of my laptop constantly refreshing the page awaiting new content for the game I had just seen. First seeing the ambient landscapes, hearing the melodies thrown at us during the preview trailer, I couldn’t help feel like No Man’s Sky would be something extremely special. From the sounds of it, It’s going to be. While personally, I felt like this E3 was lackluster in comparison to the “DID THAT JUST HAPPEN” moments of E3 2013, and by that I mean Sony, Microsoft, and Ubisoft delivered exactly what everyone expected.. 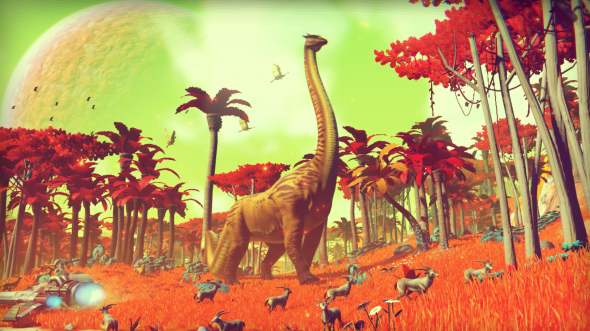 The developers behind No Man’s Sky changed the game, so to speak, with their presentation. The crew behind No Man’s Sky seem to have built a Universe for their players to experiment in, an infinite universe, with only a handful of developers. They boast a completely unlimited form of escape and a completely non tethered universe to explore and get lost in. It seems to me that they have a wildly large sense of ambition, which makes us wonder if their stomachs are too big for their eyes? Indie games like Journey, Braid, and Bastion change the way games are played, and change the way the mainstream audience looks at Indies every single time something like the three aforementioned games are launched. The big question here is if No Man’s Sky is going to be one of those games, or something greater? Completely going against the grain, the crew behind this game seem to be going for something completely ambient. Something akin to Skyrim mods aiming at an engrossing experience, except in space. The point has been made clear, the developers want you to do anything, go anywhere, and find planets and explore parts of the universe that even they haven’t discovered or seen. Randomly generated code comes to mind at this point, if you can build an ever expansive universe in the game that auto generates worlds and experiences, then I would beg the question that it is not infinite and/or limitless but in fact an expression of constantly looping content that seems infinite but is in fact a repetitious play on the theory itself? Is it, in fact, too big to comprehend, or a trick? Bugger! Let’s talk for a moment about how No Man’s Sky stole the show at the Sony E3 2014 press conference. E3 press conferences are always a huge montage of character slideshows, Dubstep (electro house now) backing tracks, and Asian business men talking in accents to a group of attendees eating out of their hands. No Man’s Sky had people talking, and possibly overshadowed the Uncharted 4 announcement trailer for one brief, shining moment. This is how you make yourself heard! This was a fine example of David vs. Goliath, showcasing that Indie games can go toe to toe with the AAA giants that Naughty Dog breeds. While the game looks to currently be in Pre-Alpha stages at best, it is a wonderful sign that Indie games are escaping into the forefront. 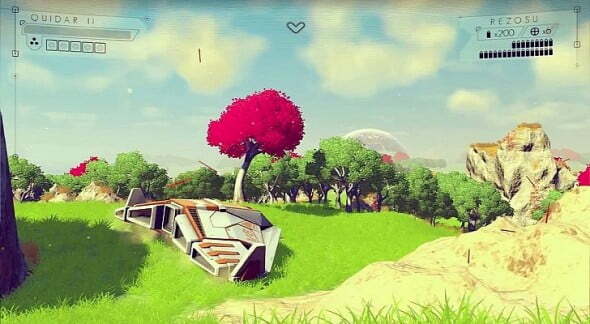 Regardless, pessimism aside, No Man’s Sky is coming exclusively to the PlayStation 4 and will boast unlimited exploration and a beautiful universe for you to indulge your strange Instagram filtered Star Trek fetishes. Hello Games has set the bar for Indie Games this year, building a hype monster that will have people watching this game closely. It’s going to be a while before anyone can play it, or before a release date is announced even. I predict a 2015 release for this one, and I’ll be counting down the days.